Human error in patient or specimen identification remains the major cause of preventable fatal reactions. Such errors (due to fatigue, stress and inattention) by technologists, nurses, interns, residents and physicians may cause routine safety procedures to be circumvented. The Bloodloc™ Safety System is the first system designed to insure that the properly crossmatched unit of blood is transfused to the correct patient recipient. Each patient who is admitted to the hospital is issued a wristband with a unique three-letter code. 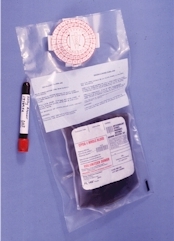 When a blood sample is drawn, the plebotomist will transcribe this unique code to the specimen tube, which code will then be captured into the patient Blood Bank records. When blood is dispensed from the Blood Bank, the blood is placed in an outer plastic bag and locked with our patented disposable combination lock, Bloodloc™. This lock can ONLY be opened using the code found on the intended patient's wristband at the patient's bedside. This insures positive identification and correlation between unit of blood and patient. Patient's code would be transcribed onto blood sample and then to lock. Lock would not open as code would differ from intended patient's code. Codes would not correspond and lock would not open. Bloodloc™ is unique in two ways: errors of patient identification are detected automatically and transfusion to a wrong patient is physically prevented. Physicians, interns, nurses and laboratory technicians all benefit by elimination of human error and resulting liability. Nurses - opportunity to eliminate the current requirement for the second person check of the wristband, labelling of blood unit and accompanying compatibility documents to insure the correctness of the unit of blood. Preservation of the hospital's good reputation for its' services to patients. Hospital risk management and insurance companies benefit from increased transfusion safety. There is no valid defense against a mistransfusion. ©2012 Novatek Medical, Inc. Bloodloc is a Registered Tradmark. All Rights Reserved.